Protecting your plasma, LCD & LED screens is made easier with our custom built flight cases, designed to withstand the rigours of touring and keeping your screens fully protected during transport. Manufactured in our Leighton Buzzard warehouse using top quality panels and hardware, we know we have a flight case to suit your needs and budget in our range of plasma cases. 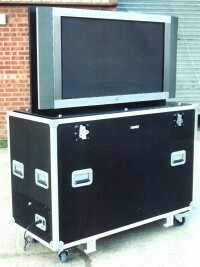 Our plasma cases will give your screens the maximum amount of protection available. We can provide many variants of plasma cases to suit your needs, from simple foam blocking to CNC routed foam inserts to match the profile of your screen. 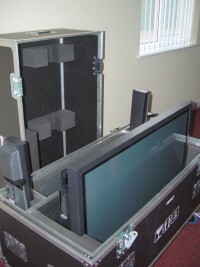 Our plasma flight cases can also be fitted with an inner compartment on vibration mounts – almost like a case within a case, to absorb more shock. Both these styles of case can be designed for one or multiple plasma screens, together with compartments for speakers, brackets and cables. At the higher end of our range is the electric lift plasma case which has an electric lift designed for flat screens fitted into the base of the flight case. This is wired into an IEC fitted into the side of the case and a remote control sensor at the front of the flight case. 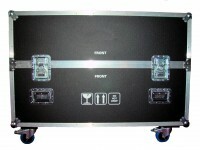 The lid has the same foam blocking or foam inserts as the other flight cases. These cases offer protection for the latest LCD and LED screens, no matter how thin.